To say that WE Global’s Ohio members influenced Governor John Kasich’s creation of the new Office of Opportunities for New Americans is an understatement. Tracing roots back to meetings in 2015, six WE Global members in Ohio (Akron, Cincinnati, Cleveland, Columbus, Dayton, and Toledo-Lucas County) began meeting as the Ohio Welcoming Initiatives Network (OWIN) to share best practices and to strategize on how they could drive a statewide agenda to make the state more welcoming and build a more inclusive economy. Over the following years, OWIN met with various officials in Governor Kasich’s Administration, which eventually led to the creation of a new Ohio Office of Opportunities for New Americans in May 2018. The work of OWIN was enhanced by numerous partners within and external to the WE Global Network. The Michigan Office for New Americans (MONA), created by Republican Michigan Governor Rick Snyder, as well as the Maryland Skilled Immigrant Task Force, provided not only models for Ohio, but thoughtful advice. Welcoming America, Global Detroit, New American Economy, and WES Global Talent Bridge all provided research, participated in calls, helped provide administrative support, and even traveled to Columbus numerous times to participate in internal OWIN meetings, as well as meetings with Kasich officials. After the office was formed, its staff embarked on a series of listening sessions across the state and issued its “One Ohio, Many Stories” report, subtitled “Strategies for Helping New Ohioans Integration, Contribute and Become a Thriving Part of Ohio’s Success” in December 2018. According to the report, the listening sessions were a virtual who’s who of OWIN/WE Global membership in Ohio, as nine of the ten sessions were co-hosted by OWIN/WE Global members. The listening sessions highlighted a need to make immigrants aware of state resources that exist to help integration. The report notes the state’s role in ESL programs, job training, and job search resources, as well as state-sponsored business advisors, but recounts feedback from the listening sessions that immigrants are unaware of many of these resources. The report calls for increasing awareness as a top priority for the new state office. In response, the Office of Opportunities for New Americans built and is promoting its website: www.newamericans.ohio.gov. The report outlines some basic economic arguments on why Ohio should welcome, encourage, and facilitate immigrant integration. Noting that the Ohio economy is facing worker shortages and that the Ohio population is aging, the report notes that immigrants to Ohio are younger and more likely to be of working age. In fact, somewhat remarkably, the report states “Since the inception of the Office, in less than six months, several employers have reached out to our office to ask us to connect them with immigrants to fill their workforce needs.” It also notes that immigrants in Ohio are significantly more likely to be college-educated, with 42.1 percent of immigrants possessing a four-year degree compared to 26.7 percent of U.S.-born Ohioans. The report touches on the economic benefits of recruiting more international students to Ohio colleges and universities, as well as retaining them to work in Ohio after graduation. Governor Kasich supported broad proposals to do so, including the creation of an initiative and report at the Ohio Department of Higher Education earlier in his administration—Ohio Global Reach to Engage Academic Talent (Ohio GREAT). The Ohio Office of Opportunities for New Americans report discusses the contributions of immigrant entrepreneurs and calls on the state’s business development arm to encourage its small business counselors to visit the ethnic neighborhoods in their regions to build awareness and increase utilization of state services by immigrant businesses. Gather information about agencies and companies that offer on-the-job English classes and job-skills training. Use the information to identify best practices that can be disseminated to other companies and industry groups around the state. Raise awareness of ESOL classes through the [Ohio Office of Opportunities for] New Americans website and contacts with social service agencies. Collaborat[e] with the Department of Higher Education to build ESOL curriculum that fits different skill levels. Work with businesses to develop a list of best practices with examples of workplace language-learning programs that have been developed. The report concludes with a Progress Report, identifying the status of 28 actions to pursue 15 opportunities, complete with lead and support agencies within state government. By providing such a detailed agenda and engaging agency stakeholders throughout state government, the Ohio Office of Opportunities for New Americans is demonstrating that it is taking its tasks of helping to integrate immigrants and building a more inclusive Ohio economy seriously. The fact that an initiative like this was created by a Republican Governor in a swing state critical to Donald Trump’s election demonstrates that there is another narrative in Middle America—one of welcoming and inclusion, built on the foundation of the economic benefits of immigrant integration. The Ohio state office and report likely would never have happened without the hard work and tenacious commitment of the OWIN/WE Global members on the ground. As national media portray America as a nation completely gridlocked and divided on immigration, immigrant economic development efforts in Ohio and across the Midwest are proving that a more pragmatic, welcoming, and thoughtful narrative is playing out in local communities. This local narrative is one that includes Republicans and Democrats–and is one that is advancing the economic interests of immigrants and non-immigrants alike. In fall of 2017, the Welcoming Economies Global Network circulated research that sought to quantify the economic impacts that President Trump’s immigration policies were having on 10 states from New York to Missouri. The research focused on (1) decline in international tourism; (2) loss of international students; (3) decline in refugee resettlement numbers; (4) loss in agriculture production; and (5) projected loss from revoking DACA status. While some of those projections have thankfully not come to bear (e.g., DACA recipients have not been deported in significant numbers), other projections have, unfortunately, come to fruition (e.g., the cuts in refugee resettlement have been even larger than predicted a little more than a year ago). A recent article and report shed new (or enhanced) light onto the economic costs of President Trump’s anti-immigrant policies and rhetoric. The costs of these policies extend from losing highly educated and talented international students to other countries to negative impacts on working-class neighborhoods throughout Rust Belt cities–neighborhoods who benefit most from population growth fueled by immigrants. In 2017, we projected that WE Global Network states would lose nearly $1 billion in annual spending from a projected 7 percent decline in international student enrollment. The projections were based on early Institute for International Education (IIE) estimates. A little of a year later, IIE has witnessed a drop in new foreign student enrollment in the U.S. of 6.6 percent in the 2017-18 academic year, double the previous year’s rate of decline. The drop in new enrollees was the biggest since 9/11 and the decline seems to be continuing this year. In fact, the number of new F-1 visas issued in Fiscal Year 2017 was less than 400,000, down from a high of 644,000 in Fiscal Year 2015 according to data from the U.S. State Department. According to IIE data, the combined annual spending in 10 WE Global states for international students is nearly $14 billion, so a loss of international students on the magnitude experienced between Fiscal Year 2015 and 2017 would be a loss of over $5 billion in annual spending and some 50,000 jobs in WE Global states alone! So severe is the problem, that in 2017 Moody’s Investor Services downgraded its credit outlook for higher education from stable to negative, citing stringent immigration policies and declining international student enrollment (which helped stabilize revenues through higher tuition). According to NAFSA: Association of International Educators, the U.S. losses of international students have been to the benefit of our competitors in Canada and Australia, whose international student populations grew 20 percent and 15 percent, respectively, in the 2016-17 academic year alone. Add the fact that the majority of graduate students in engineering, computer science, and IT at U.S. colleges and universities are international students and the impacts of these shifts have potential tsunami-like effects to the future supply of U.S. high-skilled, high-demand talent. Negative impacts from anti-immigrant policies, however, are not limited to highly-skilled and highly-educated immigrants. A January 2018 white paper from the Local Initiatives Support Corporation (LISC) chronicles how ethnic and immigrant neighborhoods and community development efforts are being hampered by Trump policies around the public charge and enhanced immigration enforcement. Noting that “community organizations may experience significant cost multipliers due to the proposed ‘public charge’ rule change”, the LISC report chronicles how changes to DACA, decline in refugee and asylum-seekers, repeal of Temporary Protected Status, and aggressive ICE detention policies threaten millions of children and adults. LISC conducted interviews with community development practitioners in Chicago, Houston, Kansas City, Los Angeles, and New York and uncovered evidence of residents foregoing health benefits, shelter, and FEMA assistance—benefits to which legal immigrants and/or the U.S.-born children are legally entitled—out of fear and misinformation. In turn, this made communities where LISC and its community development partners operate less healthy, less safe, and more distressed—making the work of community development that much harder. Anti-immigrant policies and rhetoric are negatively impacting two bright spots in the economic revitalization of Midwestern and Rust Belt cities. 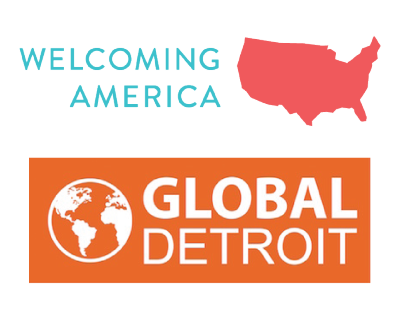 If they can’t attract high-skilled talent and international students and can’t welcome the growth of immigrant families as part of their community development plans to revitalize distressed neighborhoods, cities like Detroit, Cleveland, St. Louis, and Philadelphia will lose some of the most effective and important opportunities to achieve modest economic growth and build cities for the 21st century.